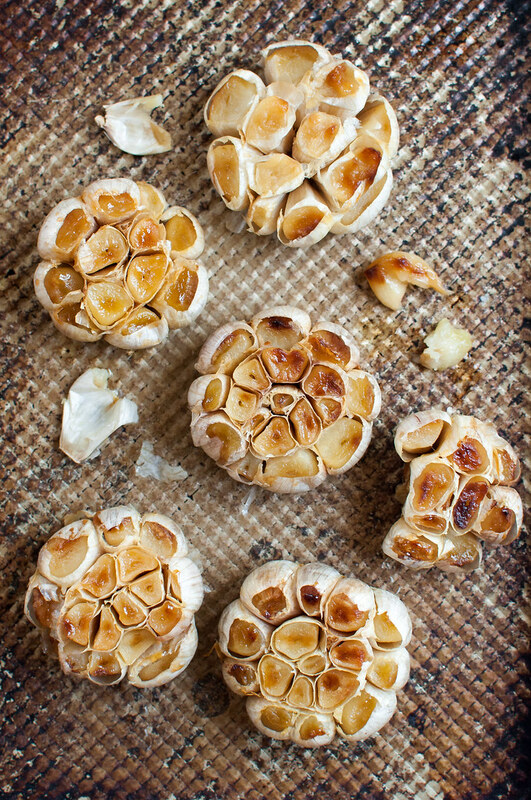 Welcome to lesson 7 of the homemade how-to series: how to roast garlic. In each lesson, I break down the steps for a home cooking skill I searched for often as I first learned to cook, or one that’s always been on my to-learn list. A recipe to showcase your new skill will follow a couple days after the how-to post! Chances are, you searched for this tutorial in a pinch, so let’s dive right in! 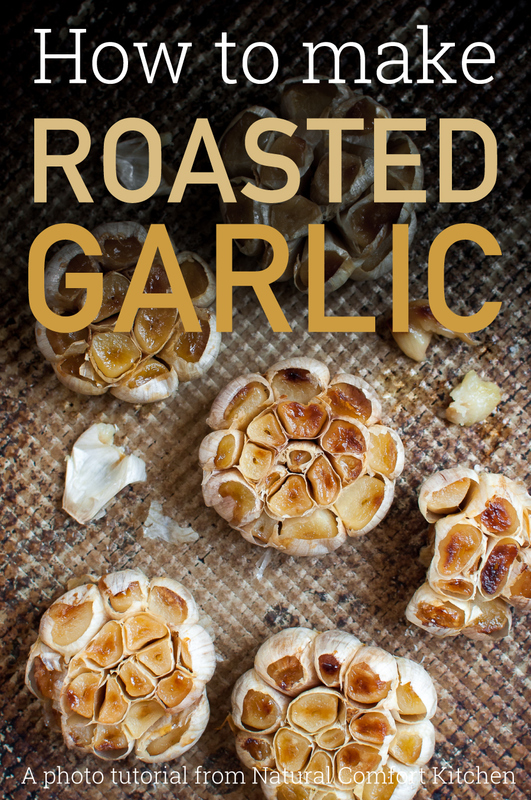 Click here to jump down and read more about roasted garlic and some ideas for how to use it. Preheat oven to 400 (F). Peel any loose, excess layers from the garlic, leaving only the peel that isn’t easily removed. Hold the garlic on its side and use a sharp knife to cut off enough of the top (about 1/3″) to expose a cut surface on the cloves but keep them mostly intact. If there are any shorter cloves that got missed, use a paring knife to carefully cut off the tops of those cloves individually. 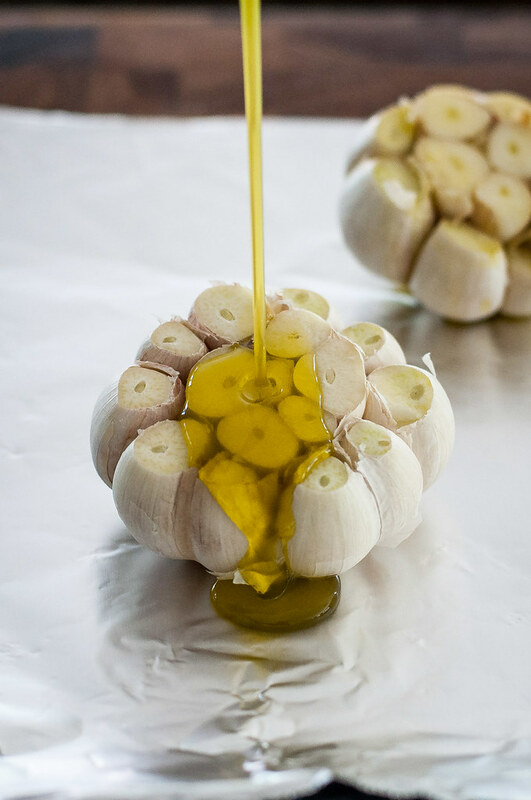 Place each head of garlic on a sheet of foil and drizzle a teaspoon or two of oil over the top of each. Use your fingers or a brush to coat the exposed surface of every clove with oil. 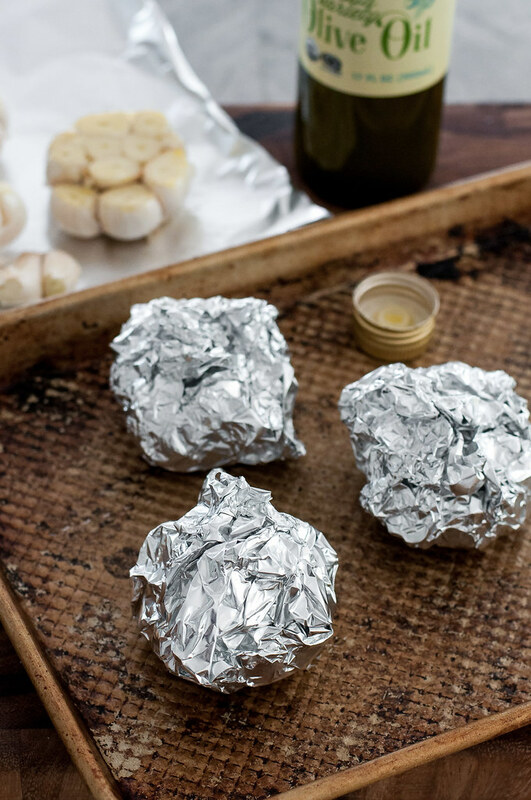 Seal the foil tightly and place garlic upright on a baking sheet. Bake garlic in the oven for 50 minutes. Remove garlic from the oven, open the foil, and make sure the garlic is very soft and a gorgeous golden brown. If it’s not, place back in the oven for 5 minutes and continue checking until it’s finished. Open foil and allow garlic to cool. 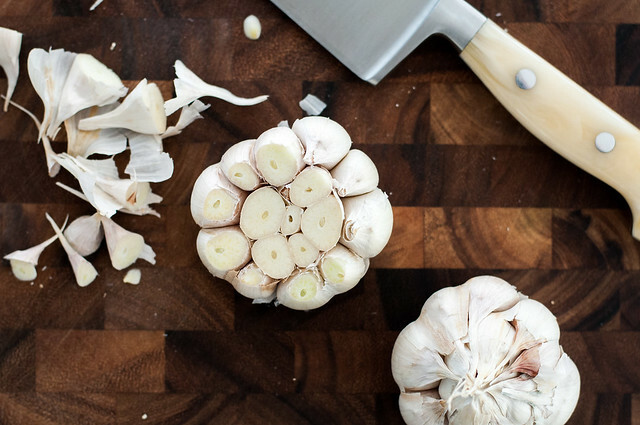 Using your fingers or a knife, push (or spear) garlic cloves out of the skin from bottom to top. Most cloves will pop right out. Use roasted garlic as desired, or store in the refrigerator for about a week, or in the freezer for months. Enjoy all that delicious garlic flavor without any of the pungent bite, and with subtle sweetness! 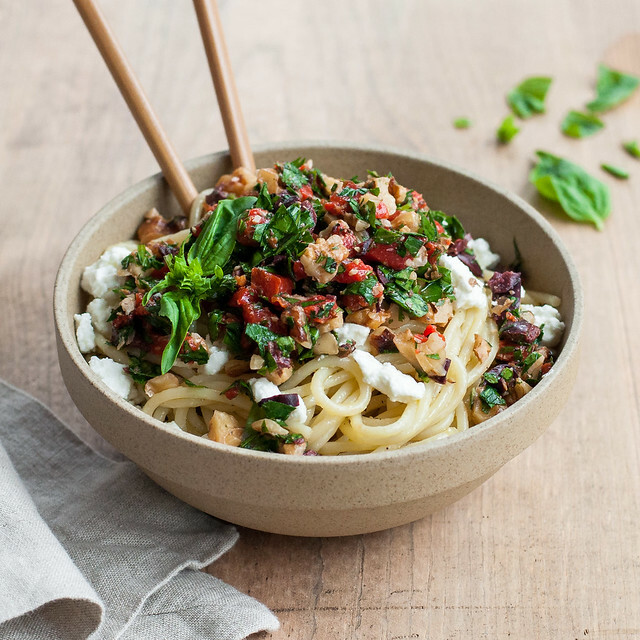 Scroll down for the quick recipe for this spaghetti “Marco Polo” with roasted garlic oil. Preheat oven to 400 (F). Peel any loose, excess layers from the garlic, leaving only the peel that isn't easily removed. Hold the garlic on its side and use a sharp knife to cut off enough of the top (about ⅓") to expose a cut surface on the cloves but keep them mostly intact. If there are any shorter cloves that got missed, use a paring knife to carefully cut off the tops of those cloves individually. Remove garlic from the oven, open the foil, and make sure the garlic is very soft and a gorgeous golden brown. If it's not, place back in the oven for 5 minutes and continue checking until it's finished. Use roasted garlic as desired, or store in the refrigerator for about a week, or in the freezer for months. Enjoy all that delicious garlic flavor without any of the pungent bite, and with subtle sweetness! Vegan spring bruschetta with roasted garlic lentil dip will put that roasted garlic to good use, preferably at your next porch happy hour or weekend picnic! Down below there are some specific ideas for using roasted garlic, but you can substitute it most places you would use raw garlic, for a caramelized, sweet garlic flavor without the pungent punch. 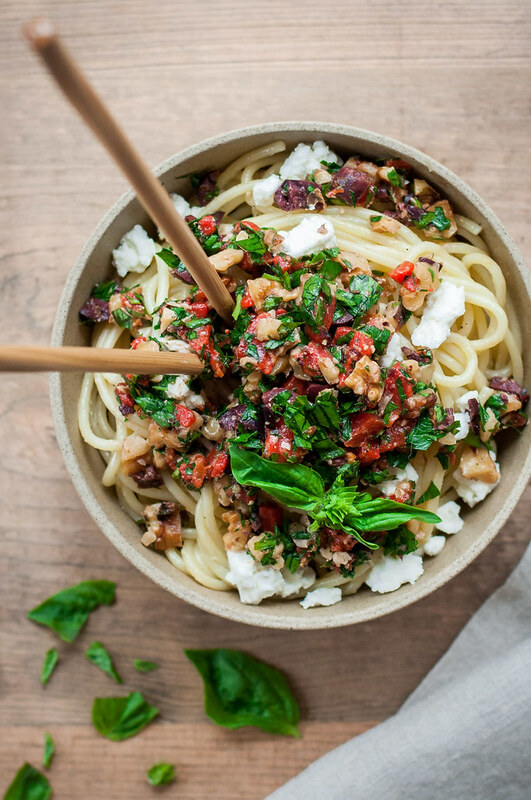 If you’re craving carbs (as I usually do at the mention of garlic), try this recipe for spaghetti “Marco Polo”. It’s inspired by Julia Child’s spaghetti recipe by the same name, in a somewhat rare hardcover copy of From Julia Child’s Kitchen, a book I was lucky enough to score at Métier Cook’s Supply while honeymoonig in Austin. Vegetarian/vegan with cheese omitted. This is by far my new favorite spaghetti recipe. Instead of dousing the noodles in heavy tomato sauce, they're tossed with your favorite olive oil which has been quickly infused with sweet roasted garlic. 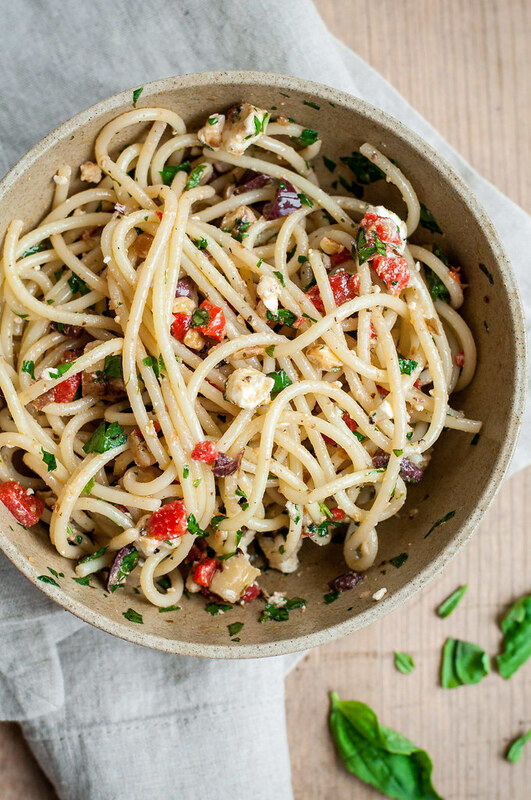 A "pesto" of walnuts, olives, roasted peppers, and fresh herbs has all the flavors and colors to further enhance garlicky spaghetti. It's an adventure to eat! Bring a large pot of water to boil, add about 2 teaspoons of salt, then the pasta. Cook until al dente. This will depend on the type of spaghetti, but mine required about 11 minutes. Drain and set aside. Meanwhile, in a medium bowl, mix nuts, olives, roasted peppers, fresh herbs, and plenty of salt and pepper. In the now empty pasta pot, heat olive oil over medium, add garlic, and stir. Cook for a couple minutes until very fragrant and garlic is broken up, reducing heat if garlic sticks to the pan. Remove from heat and toss garlic and oil with spaghetti. Serve topped with the nut and olive "pesto" and plenty of feta. Keeps well as leftovers for a few days. Adapted from Julia Child's From Julia Child's Kitchen. The quantities and ingredients for the pesto are quite flexible. You could use pine nuts or pistachios, black California olives (or your favorite type), and seasonal fresh herbs (reduce the quantity for stronger, more woodsy herbs). Parmesan cheese is delicious in place of feta. The more garlic I roast, the more I understand its culinary versatility and value. Personally, I’m a garlic lover, and my husband even more so. In a recipe that calls for three cloves, I’m using at least five. Maybe you can relate. Or maybe you’re not a huge fan of raw garlic, reducing the quantity or cutting it completely out of recipes. 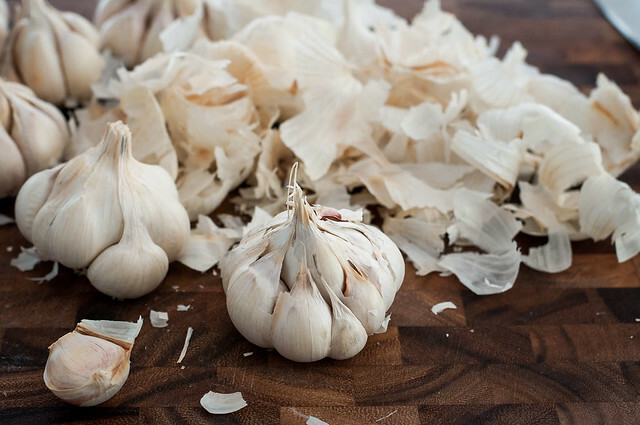 While I fell in love with garlic from my first taste, I understand where you’re coming from, since we barely even knew what garlic was, save from a spice jar in powdered form, in my house growing up. The good news for you is that there’s a strong chance the flavor of roasted garlic will add new dimension to your cooking without offending you or making you nauseous. It does have the essence of garlic flavor, but without any harsh pungency. It won’t stink up your breath quite as much, and it’s a gorgeous golden color with the taste to match: sweet and caramelized. 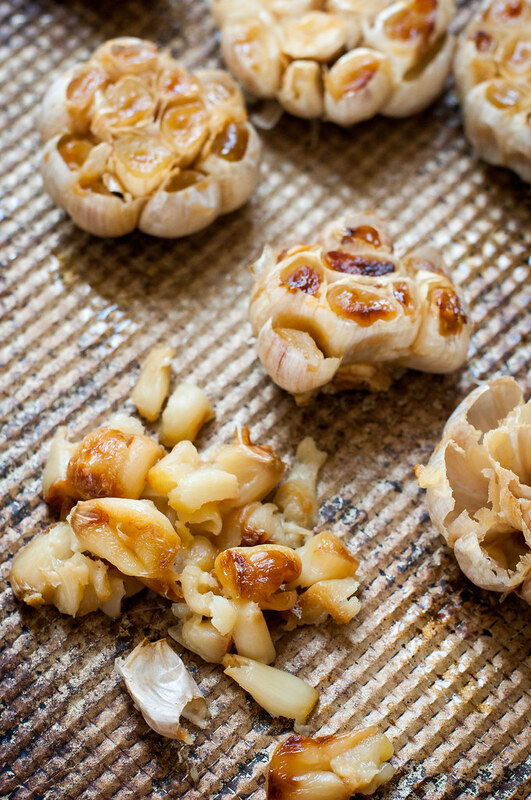 The texture is soft and smooth, so there’s no messy mincing involved when working with roasted garlic. With just a gentle mash, it dissolves into whatever you’re cooking. And speaking of mash, it blends into the most heavenly mashed potatoes you might ever taste. I heard I can get botulism from garlic. Is that true? Under certain conditions, garlic, a low acid “vegetable”, can promote the growth of bacteria that results in food poisoning known as botulism. However, it’s rare (I would say impossible, but I’m not a scientist) for this to happen with roasted, properly stored (both temperature and duration) roasted garlic. Some internet comment threads would have you believe otherwise, but if you do your own basic research, or rely on mine, I think you’ll set your mind at ease. Botulism from garlic is most common when raw garlic cloves are left to infuse olive oil in a sealed container at room temperature. Hopefully, if you infuse your own olive oil, you already know this. Also beware when including garlic in the oil mixture for marinated mozzarella or marinated vegetables, such as peppers or artichokes. 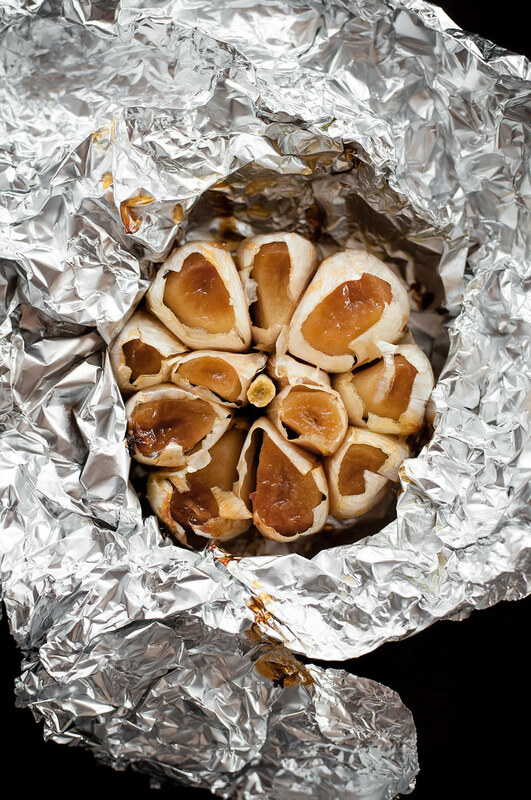 When it comes to roasted garlic, the risk of botulism is all but eliminated. You’re following the directions to store unused roasted garlic in a refrigerated or frozen state, never at room temperature (even if you decide to use it to infuse oil). If you refrigerate roasted garlic for a week and still haven’t used it, toss it or transfer it to the freezer, and you’re good to go. What if the garlic doesn’t brown like the pictures? You may notice that your roasted garlic is tender and fragrant, but that the tops of the cloves didn’t turn that nice golden color. It’s happened to me before, and it’s perfectly fine: you should still use the roasted garlic as desired. For better browning next time, try placing the oven rack one position closer to the top heat source, or folding the bulk of the foil under the head of garlic, so there’s only a single layer of foil over the exposed cloves. Make roasted garlic butter and enjoy the best garlic bread of your life. Mash a spoonful into softened butter, spread on bread, and bake immediately or refrigerate. Whip up some roasted garlic guacamole. Mash it into mashed potatoes, along with olive oil and parmesan, and a pinch of dried or fresh minced rosemary. 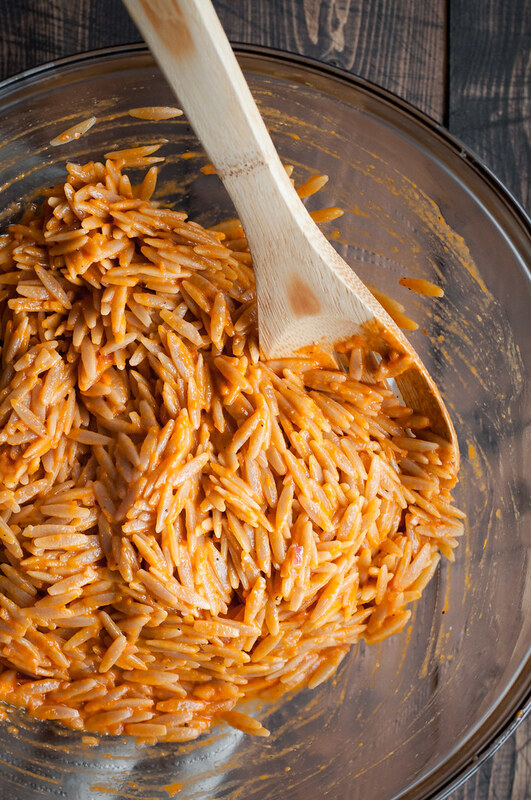 Replace fresh garlic with roasted in fresh tomato dressing (excellent on pasta salad and pictured below). Change up your homemade hummus or pesto game by using roasted garlic instead of raw. Roughly chop a few cloves and stir it into any vegetable soup as it simmers. Make roasted garlic lentil dip! A hummus-like, vegan dip that’s great on crostini. Wow, I love this. 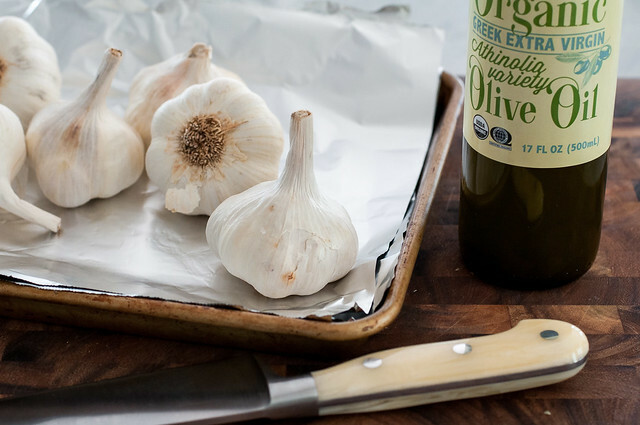 I use garlic every day one way or another, and never just one clove. The first time I had roasted garlic was in a restaurant in Seattle many years ago. It came in a little clay garlic roaster pot. Our server lifted the lid with a flourish and the aroma wafted out. We all oohed and ahhed at the beauty and scent of the thing. Then we nearly broke our arms reaching over one another to get big dabs of the creamy stuff and smear them on crusty bread. Well, I’m exaggerating the arm-breaking part. We were civilized enough, but boy that was good. Pinning so I can give your roasting method a try one day soon. I know we’ll love it. Thanks for the botulism tips. Love that story Kathryn! Isn’t it great how we form such vivid memories around food? Hope you enjoy!